As I plunge through jade-green, dripping foliage, each branch that reaches out to me beckons me onwards through the Daintree Rainforest and out to the Pacific Ocean, glinting in the sunshine beyond the tree canopy. Out there, beyond the sugar-sand beach and nodding palms of Cape Tribulation, the water oscillates deep blue and turquoise. Its clean, clear waters cover part of the largest reef system on earth, the Great Barrier Reef. Pacific waves break across this vast underwater wonderland, their white caps highlighting the garden of coral tendrils that runs along the edge of Australia. This is Queensland – and it is fabulous. The easiest gateway to the state that many claim to be the ‘real Australia’ is Brisbane, in its southeastern corner. This riverside city’s café culture kick-starts the Journey north, up into the tropics and to some of Australia’s very best islands and beaches. And, as I head north, it is not only the temperature that increases, but also the abundance of Australia’s wildlife – its whales, dolphins and turtles, its koalas and cassowaries. 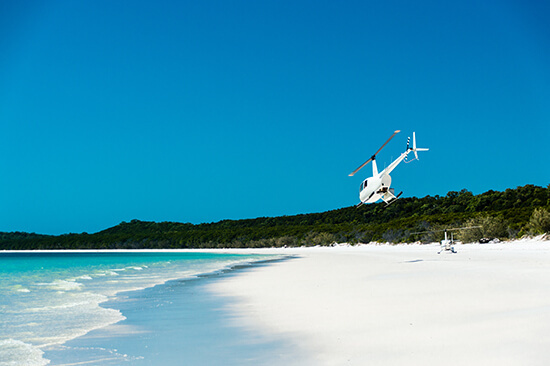 No visit to Queensland is complete without seeing the mind-blowingly scenic Whitehaven Beach, its powdery sands aswirl amid turquoise waters. It sits at the head of Hill Inlet on Whitsunday Island and, after cruising across from neighbouring Hamilton Island, I spend a happy hour or two paddling in water just inches deep and sinking my toes into the sand. But Whitehaven is not the only beach to have me spellbound as I unfurl my towel along the Queensland coast. 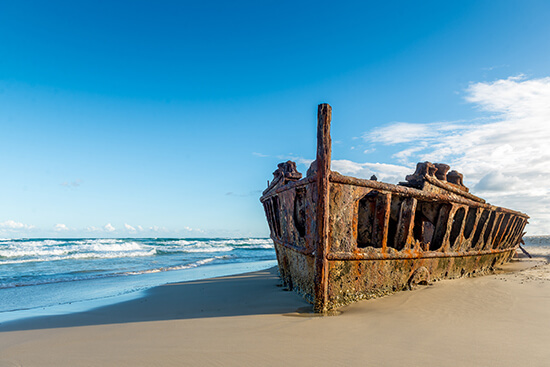 There is also 75-Mile Beach, the epic sandy spine of Fraser Island, where we cruise along in a 4X4, stopping to drink from crystal-clear streams and squint through the sunshine at the dingoes. And then towards the north is Palm Cove, where shoes are obsolete and I find myself sunbathing on its spotless golden sands with more palm trees for company than people. These are Queensland’s big hitters – and they attract plenty of sun worshippers and surfers – but there are hundreds of more secluded beaches that I seek out off the tourist trail. The Whitsunday Islands yield plenty of near-paradises, from the immaculate sands that encircle Hamilton Island to the wedge-shaped white beach clamped to one end of South Molle Island. Here a boat trip is a must, sailing between the islands and coral cays that are scattered across the warm waters of the Coral Sea, dropping anchor to swim with tropical fish and wade out to beaches brushed smooth by the sea. More than once a day I am making the first footprints in the sand – exploring here feels like constantly forging my own path. Further north, Magnetic Island sits an easy 25-minute ferry ride from Townsville and makes for a perfect day trip. Koala-camouflaging gum trees run down to golden sands and two-thirds of the island is protected as a National Park. There is plenty of sand here too, from Picnic Bay with its beachfront fig trees in the south to the caramel curve of Florence Bay in the northeast. My favourite is Alma Bay, near the aptly named community of Arcadia. Here, I snorkel out beyond smooth grey rocks and check out the tropical fish as they dart and weave through the coral reef just offshore, before returning to flop on the sands and soak up the sunshine. 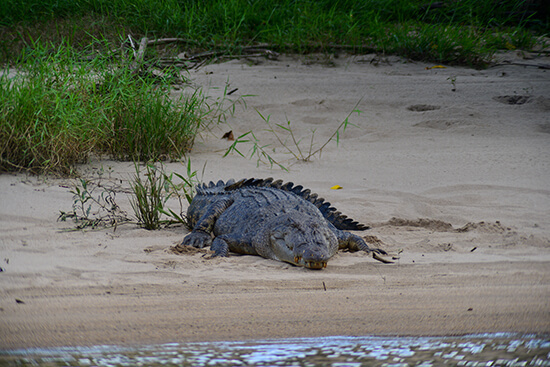 It is easy to assume that all wildlife here is to be found in the water, but there’s plenty to see on land too. After dark at Mon Repos beach, just to the east of the sugar-cane town of Bundaberg, I catch sight of loggerhead hatchlings set to fight their way out of their sandy burrows beneath tonight’s bright moon. 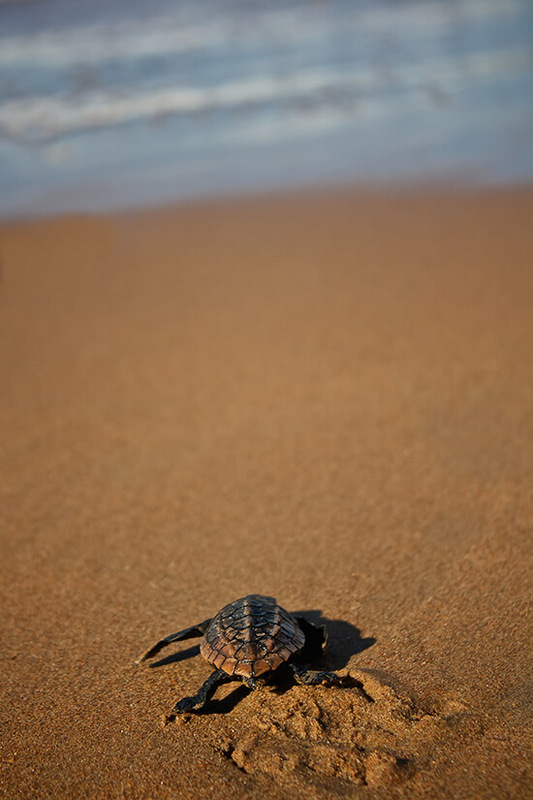 This is Australia’s most accessible loggerhead turtle rookery and patience is richly rewarded with the moving experience of seeing several dozen tiny turtles making their way comically towards the ocean (nesting turtles are best seen from November to January, hatchlings from January to March). Further north, near Cairns, I head to the Atherton Tablelands, where there are opportunities for tasting trips to sample the region’s many gourmet delights – wine, cheese, ice cream and beef jerky. And I get off the ground for the first time since arriving in the state, flying above the pristine World Heritage-listed rainforest canopy on the Skyrail Rainforest Cableway, its gondolas gliding above palms and ferns towards the village of Kuranda. At Red Peak Station I follow the boardwalk that winds along the forest floor. I lose myself among ferns large enough to engulf me, and follow the electric-blue wings of Ulysses butterflies and the call of cockatoos. At Kuranda there’s also the chance to learn about Australia’s indigenous people at the Tjapukai Aboriginal Cultural Park, and board the spectacular Kuranda Scenic Railway, rising to 328m above sea level. Completed in 1891 to connect the interior to the coast, it remains a marvellous feat of engineering. Snaking its way up the Macalister Range there are amazing views of waterfalls and steep ravines, so close to the rainforest you could put your hand out of the window of the wood-panelled carriages and touch it. At my final stop, up in the Daintree Rainforest, where the Dubuji Boardwalk is even wilder, the atmosphere is even more arresting. 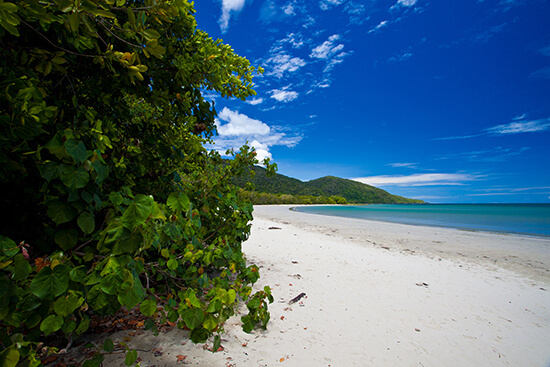 I spot a cassowary, a fearsome bird that makes up for its flightlessness with feistiness, and a crocodile sunning himself on the beach – which is why the beach at Cape Tribulation is not one for swimming. As I watch him watching me, I reflect on my journey to paradise and realise I have found it not once, but over and over again. There truly is no place like Queensland. Spanning two-thirds of the northeastern coastline of Australia, the Great Barrier Reef is the world’s most extensive coral reef system, stretching 1,430 miles from Bundaberg to Cape York, the northern tip of Australia. And at some 135,000 square miles, it’s equivalent in size to 70 million football fields, or the whole of Japan! This vast underwater world is rich in marine life, home to more than 30 species of whales and dolphins; 1,625 species of fish; 411 species of hard coral and over 150 species of soft coral; as many as 3,000 species of molluscs; six of the world’s seven species of marine turtles; and giant clams that are over 120 years old – not forgetting millions of nesting seabirds. The most popular way for visitors to experience the Great Barrier Reef is by boat. Scuba-diving and snorkelling, sailing, bareboating, expedition cruising and glass-bottomed boat trips are just some of the world-class water-based activities on offer. For a truly breathtaking view, take to the air for a scenic flight over the area. Other activities are on offer across the Reef’s 600 islands, where you can stay at a tropical island resort, camp on a deserted island, hike one of the world’s best trails, meet the wildlife, or sit back and soak up the sun from white sands. Coral reefs have been growing in the Great Barrier Reef region for more than 25 million years, but only began to form the large reef system that we can see today around 6,000 to 8,000 years ago. A coral reef forms when tiny coral polyps convert minerals from the ocean into hard limestone skeleton homes, which become the building blocks of a coral reef system. Zooxanthellae algae play a part, too, living inside the coral’s cells and creating its vibrant colours. Coral cays are established when coral skeletons, algae, other reef creatures and sand are trapped by currents. 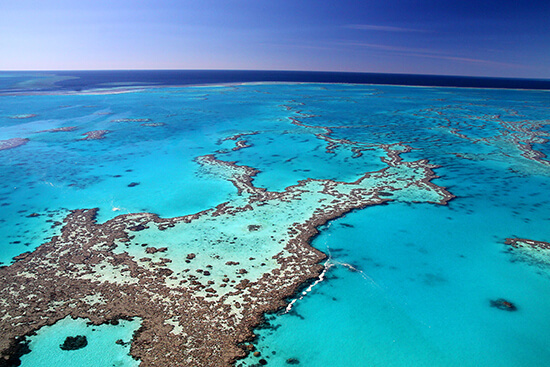 As the environment stabilises, a coral cay is formed; about one-third of the coral cays on the Great Barrier Reef support vegetation. For a memorable way to learn more, stay overnight on a coral cay at Lady Elliot Island, or immerse yourself entirely by joining the 16-day Great Barrier Reef In-Depth Journey.